The earth-shaking, night-illuminating, eardrum-rattling truck-pocalypse you may have witnessed on an August evening last year wasn’t some sunstroke-induced fever dream: It was the annual Light Show Truck Parade, a highlight of the Eau Claire Big Rig Truck & Tractor Show, now in its fifth year. The parade – which involves scores of dazzling semi trucks thundering through town at dusk – is just part of the show, which runs Aug. 15-17 in the Chippewa Valley Technical College parking lot. 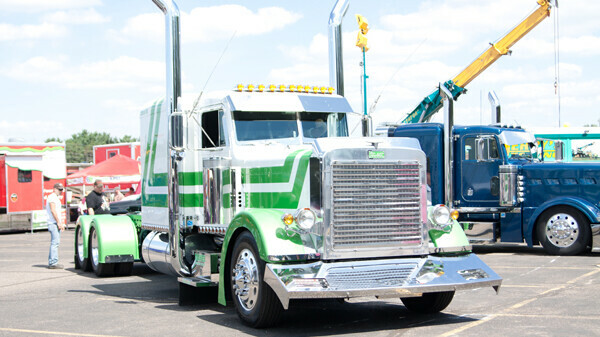 In addition to the Saturday night parade the event showcases a smorgasbord of customized over-the-road semis which compete for awards for best paint jobs, engines, lights, interiors, etc. This year, for the first time, farm tractors have been added to the mix, so there will be even more exhaust pipes and engines to ooh and ahh over (as well as a tractor parade Sunday afternoon). Alex Debogorski, star of the History Channel reality series Ice Road Truckers, will be on hand to meet fans and sign autographs, and there also will be music, food, exhibitors, demonstrations, a kids’ area, and more. Whether you’re a devotee of diesel driving or someone who doesn’t know the difference between a jake brake and an air horn, convoy on down for some fuel-injected fun.